I don't know if it's my mushy pregnancy brain, but I couldn't really think of any favourites to put in this month's favourites post! I've pretty much been using the same things I've used for the past few months, which should probably tell you that they're well-loved. Since I've been loving the same products for a while now, I thought I'd do this post a bit differently than usual. Instead of only giving you the three new favourite additions to my routine, I thought I'd give you a rundown of makeup products I currently can't live without. 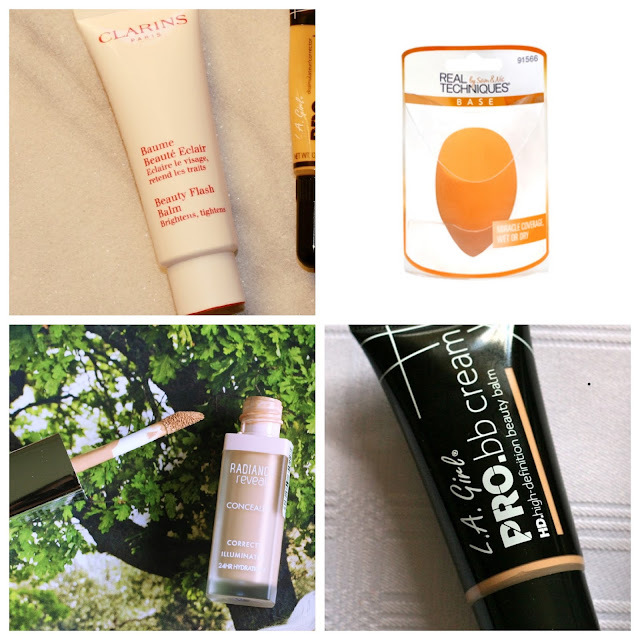 As for primer, it's no surprise that the Clarins Beauty Flash Balm made the cut (I recently spoke about it here). It leaves my skin hydrated and refreshed and ready for the next step. The next step being my beloved L.A. Girl Pro BB Cream in "Fair", of course! After that I use the Bourjois Radiance Reveal Concealer in "02 Beige" (more on it here), all applied with my Real Techniques Miracle Complexion Sponge (I recently spoke about it here). I hate doing my eyebrows, so if I find something that works on them, I stick with it until something even better comes along. I go in with the L.A. 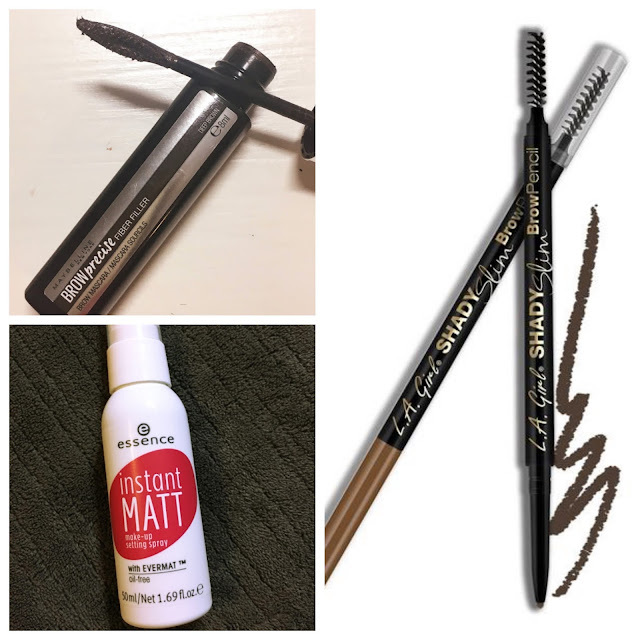 Girl Shady Slim Brow Pencil in "Brunette" and then I comb through my brow hairs with the Maybelline Brow Precise Fiber Filler in "Deep Brown" (I spoke about it here). Another important step is setting my makeup and I'm currently loving the essence Instant Matt makeup setting spray (you can read more about it here). As for the three new items: I've really been enjoying using Bio-Oil on all the parts of my body that are starting to stretch. It's a tad greasy (it's an oil, after all), but it really hydrates my skin. Apparently having itchy skin on your stomach is another fun pregnancy symptom and I haven't had it very often. I'd like to think it's due to my Bio-Oil applications. For the rest of my body I'm using the Palmer's Firming Butter which smells delicious and comes in a handy pump bottle. 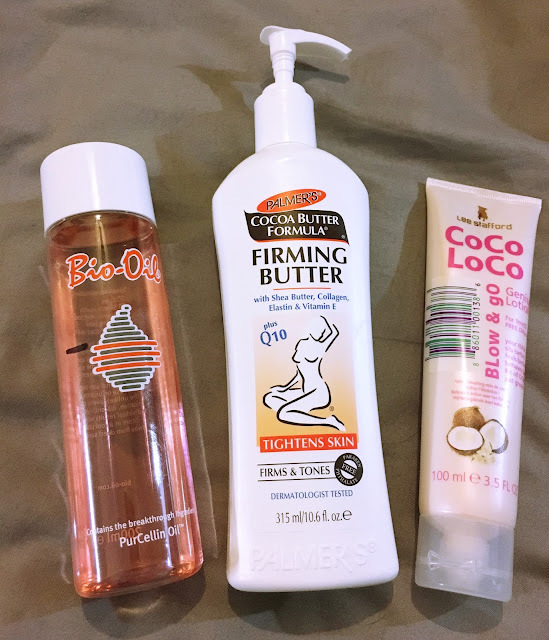 I've also been enjoying the Lee Stafford Coco Loco Blow & Go Lotion (I spoke about it here) for days when I curl my hair and I want it to last. There you have it, essentials for an everyday makeup look and my makeup favourites rolled into one.